As promised, in 2018, I’m going to be focusing on reviewing products that will help you create (with ease) amazing, profitable online businesses. My tool for today is one more tool that I would recommend you try out for yourself. For the past 5-7 years, I have been making money online and since my traffic is highly influenced by social media, getting a tool that will help me manage my social media efforts has been at the top of my priorities. 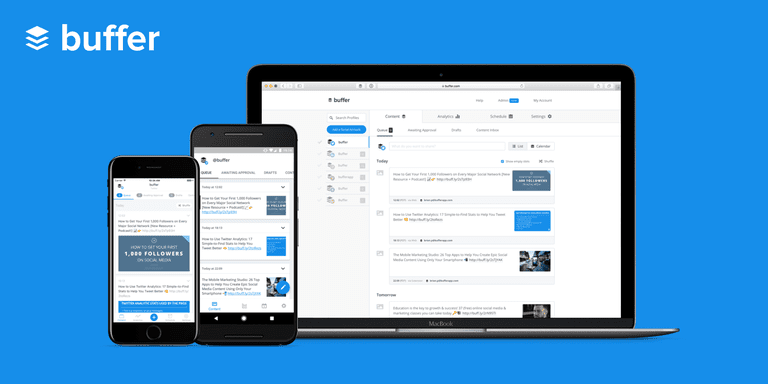 Introducing the Buffer App, the social media management platform. I discovered Buffer about 5 years ago and it has since been one of my top recommended tools when it comes to blogging and social media. I use it daily, and most of the success I’ve had with my blogging was aided by this amazing platform’s ability to cut my social media management time in half! In this Buffer App review, I will show you how to use it and WHY you need to start using it. Yes, it is… If you want to amplify your social media efforts, stop reading and go get a free Buffer account right now. However, in this review, I want to explain to you the inner-workings of Buffer. A “behind the scenes” look if you will. I will also be sharing some of my issues with this program, which I suggest you check out too in case one of the missing features is a deal-breaker for you. 3.5 million users in 5 years is a great feat, a true testament to how amazing this Buffer App really is. As I said in the introduction, I use Buffer on a daily basis. I schedule posts (from this blog and others) to go out on a schedule on the 10 social media networks I have connected to it. This is my dashboard, which also shows you the many social networks you can connect to Buffer. My love for Buffer was solidified when they added Pinterest to the list of networks. As you may know; Pinterest is my #1 traffic source here so it was a really good morning when i saw that Buffer now supports Pinterest. This image below shows you how your schedule for a specific channel would look once yoi start adding automated posts to go out. The example for this channel is my own personal Twitter account. You also have the ability to publish directly from Buffer using the “What do you want to share box?”. That is basically how Buffer works. Very simple and easy to follow. That little-highlighted box is how I share most of the content I find (and mine too) on my social channels. Once you join Buffer, I suggest you get this extension asap (for Chrome). You can click on that box up there and share the entire page or you can scroll down to an image, right click and have the image ready to go in your Buffer ready to be captioned and scheduled. As you saw from the few screenshots I have, the Buffer dashboard is so easy to navigate. There are no complications whatsoever and everything is clear to you. I once used a competitors’ service and I couldn’t find my way around the software (more on that later). The Buffer Blog is also an amazing resource of information when it comes to blogging and using social media. You can read it right now (even if you’re not a member of Buffer). Another awesome feature of Buffer is the “Power Scheduler”. With this feature, which you can access with the Chrome extension, lets you schedule posts for months in the future. I usually set my blog posts to go out once every 3 months, that means with the power scheduler, I can queue up my blog post for a year. I have updates set to go live as far as 2017! It is just so great to be able to set it once and forget about it. Analytics are a great way to show you how the content you’re scheduling is performing. It also shows you the “Most Popular” and ‘Least Popular” so you can know what type of content is performing best and at what time. This is useful if you want to have a chance of going viral on social media. I suggest you study these analytics very well. The RSS feature connects to your main blog (linked to your channel) and you can then pull the blog post you have published and add them directly into your schedule. I personally don’t use this much as I like to share my posts with images but in some cases, it might work (especially for Twitter). Everything you can do on a desktop, you can also do on the Buffer app for your smartphone. You can easily share images, texts or video on the go with their application and it is just as smooth as using it on a desktop. Big thumbs up for the mobile app. I like it very much! I am writing this review telling you how awesome Buffer is but if you decide to join, I will not get paid a cent from it as they do not have an affiliate program yet. It’s no secret I make my money through affiliate marketing and I am constantly sending traffic to the Buffer app. It would be nice if I could get paid for it LOL. I would like to explain to you how to use Buffer but there are plenty of tutorials on YouTube that will show you just how to do that. Here is one that I have found that is great at explaining exactly how to use Buffer. I suggest you take a look at it before deciding on Buffer. and even just a regular person (with no intention of using social media for business). How Much Does Buffer Cost? As you can see, there are a lot of membership plans to choose from but if you’re just a one wo/man blog, I suggest you stick to the “Awesome Plan” like me. You can connect up to 12 social media profiles and also schedule up to 200 posts at one time which is more than enough for a blogger. Check out Buffer’s pricing plan. Yes, there are but by no means, I can tell you how good or bad they are compared to Buffer. I’ve only used one competitor product (HootSuite) for a few minutes and I decided to go back to Buffer. Here is a full list of social media tools that are alternatives to Buffer. I love it and it frees up so much of my time. If you’re struggling right now to get a foothold on social media and would like to minimise the effort while amplifying your results, then Buffer is definitely for you. I suggest you start out on a free trial and if you like it, feel free to go on to premium. If you have any questions, be sure to drop me a comment down below and I’ll be happy to answer it for you. I’m a big fan of Buffer and I want you to try it out and see if it can help you supercharge your social media efforts.